Hey there food fight fans! 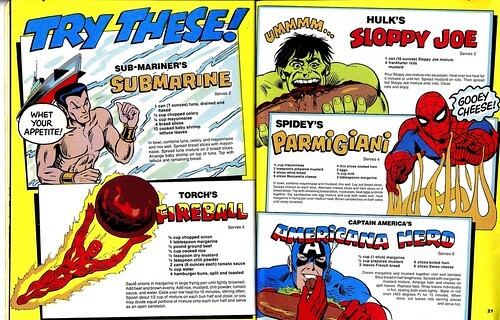 Hopefully you caught last week’s post where we put side dishes from the DC Super Heroes Super Healthy Cookbook (DSHSHC) and the The Mighty Marvel Superheroes Cookbook (MMSC) head to head in a culinary cage match to see which was the most edible. This week, the battle continues! I, Tiny Doom, will be cooking for Marvel, while my culinary compatriot The Red Menace will be repping for DC. The Goog continues his role as "The Watcher", eater of horrible foods, and general good sport. Ground rules remain the same. 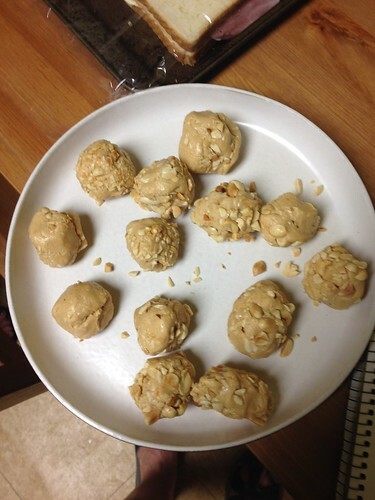 No improvising or improving the recipe. Ingredients should be in the spirit of the times, ie. no using fancy rosemary ham in place of standard cold cut ham, no matter how much one likes the rosemary ham and usually refuses to eat other cold cut ham varieties...but I digress. On to the main event of main dishes! I’m going to admit I picked this recipe due to the total disconnectedness of it, and the picture of Spider-Man with cheese webbing. It’s called Parmigiani but there is no parmesan, nor is it Parmigiana in the traditional sense. There are barely any Italian influences, except mozzarella. 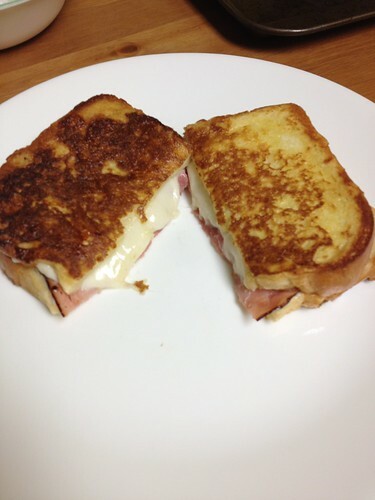 It’s a Monte Cristo! That said, I know what the Red Menace is making, and this recipe does have more of a potential of being edible (read: no cans were involved). Keeping with the spirit of the recipes, I bought all supermarket ingredients, white bread, regular cold-cut ham, and pre-packaged mozzarella (or as we called in growing up “rubberdella”-yes, I am of Italian decent). 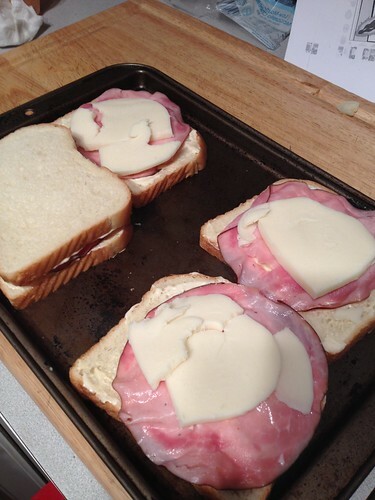 The sandwich prep is pretty straight forward. Though it called for a lot of the mayo-mustard mix to spread on the bread. I don’t love mayo and don’t use it very much. Apparently this sentient condiment sensed this and the first scoop I removed from the jar slid off the spoon to splat soundly on my exposed foot. I don’t have photographic evidence of this because I was too busy cry-voming, but trust me, it was awful. 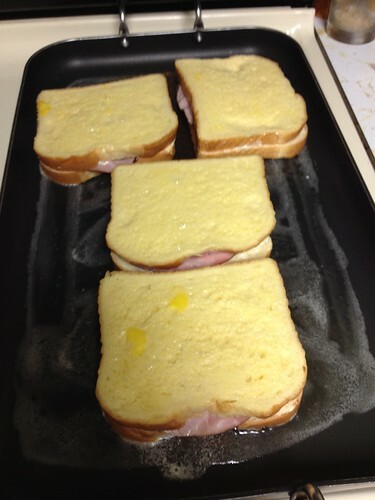 Once the sandwiches are made you dip them in the egg mixture, like making French toast. Then you cook them on a griddle or frying pan. Like The Thing's omelet, the concept here is not bad. In fact, with the right bread and sandwich fixings, I think you could make a pretty good (while not very good for you) sandwich. Okay, here's the deal. 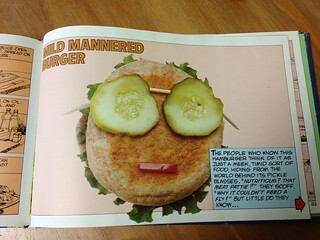 I knew that this burger would probably NOT be delicious. But I had two goals. One was to make a main-dish that wasn't basically just another ham sandwich or tuna sub. The other was to continue the mad exploration of wheat germ in everything. 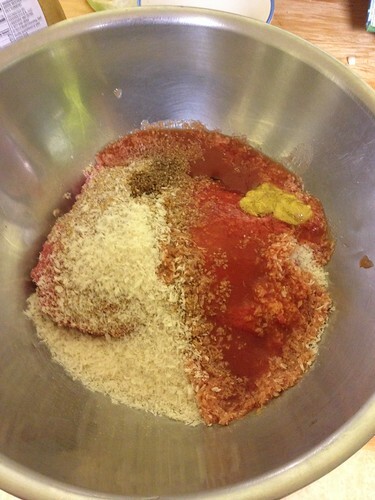 In addition to the germ, this recipe calls for breadcrumbs as filler. While I'm not sure that panko would have been in the average American kitchen circa 1981, we live in 2014. It was what was in my kitchen and I felt like homemade breadcrumbs, which were my other option, were even less in the spirit of the project, so there you go. Then the directions forgot to tell you to put said breadcrumbs into the bowl, but I did it anyway. 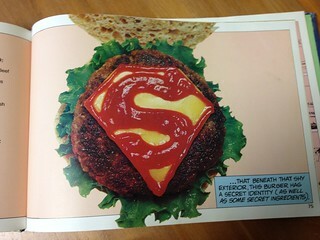 I know what you want, DCSHSH cookbook, even when you don't. The other slightly weird ingredient here is tomato juice. I mean, I get what you're trying to do here, DCSHSH, or at least I think I do. You're trying to sneak some vitamins into this burger. You're also, maybe, possibly, trying to amp up the umami in this beast, even though in 1981 that was barely a concept. But I'm thinking tomato paste might have accomplished both goals more handily. OH WELL. The other ingredients are soy sauce (umami again, and salt! ), mustard, and a healthy dose of self-loathing. The recipe also didn't specify how much soy sauce - it just said 1. One teaspoon? One tablespoon? One cup? I went with teaspoon because that was how much mustard was in there and it seemed likely. 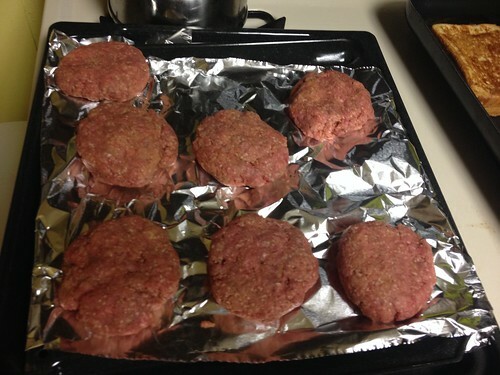 Once you've made nice little patties, you have to cook them. This is not accomplished by grilling the burgers, nor by pan-frying, which is the method I typically employ indoors. Instead, you have to broil these suckers. I don't know if this to make them "healthier" or if the makers of this cookbook thought that a 500+ degree oven was safer than a frying pan spitting grease. Frankly, both seem a little dubious to me, but I don't make the rules, I just follow 'em. Finally, while I did not go full-on Clark Kent with the buns (SORRY THE GOOG) I did decide to attempt the cheese-shields for the Superman portion of the burger. Go to the tasting notes to find out what happened with that, but hold this image in your mind. They look so nice here, don't they? Tiny Doom- As it was, this was edible, but not overly exciting. The ham and cheese didn't have much of a distinctive flavor, and the mustard, while there, was not really enough to make this much beyond "fine" and "all right". I ate half my sandwich since I knew I had a burger to come. I would use this method again, but with a much more compelling filling, and only on a "long run" day. The Red Menace - This was tasty in an incredibly one-note way. That note was salt. If you like salt, possibly in a light and fluffy sandwich, Marvel has got you covered. If, on the other hand, you are looking for a complex interplay of flavors, well, that ain't happenin', kid. The Goog- Gooey, cheesy. 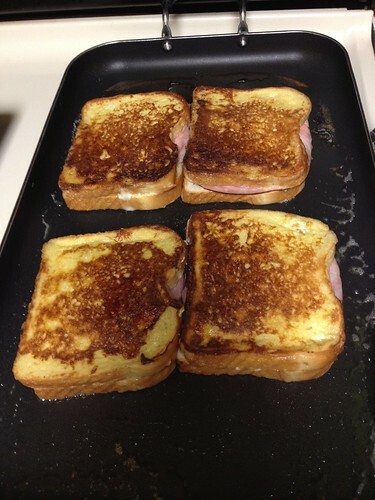 It was a grilled cheese with ham between two slices of french toast. Could have used more ham, maybe some salt, at tomato would have been welcome. Mostly tasty, but not terribly healthy. Note: It's possible that combining the burgers and the Parmigiani we might have actually has a balanced dish...at least balanced in terms of sodium intake. 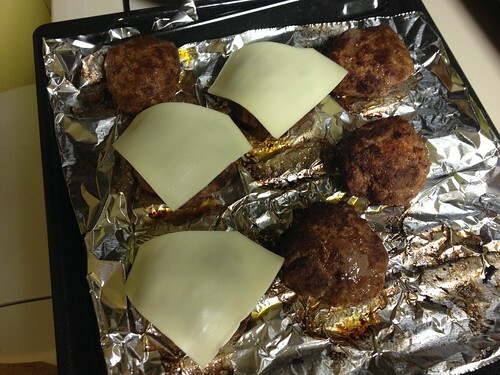 The Red Menace - As you can see, a mere minute under the broiler was not kind to my lovely cheese-shields. I also cannot free-hand a ketchup S to save my life. If these were little tiny meatloaves, instead of burgers - well, they still wouldn't be that good, because unlike the Parmigiani, there was NO salt to be tasted in these bad boys. 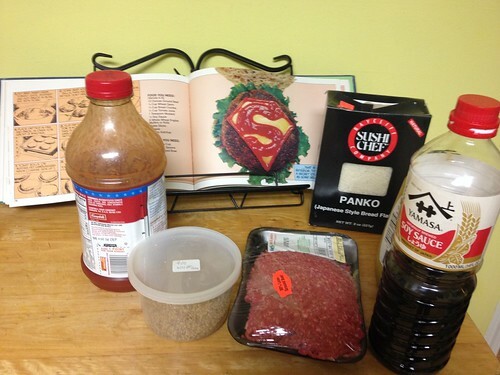 Apparently a mere teaspoon of soy sauce is insufficient to flavor 6 burgers. And the wheat germ was indeed incredibly...present. Both the consistency (incredibly soft) and the taste (slightly wheaty?) were affected by its inclusion. All of that said, they'd be just dandy with a lot more of all of the flavoring and a lot less of the fillers. 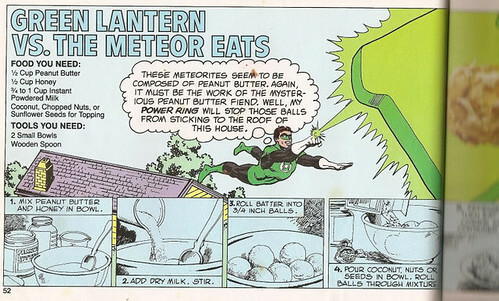 PS: Mr. Menace stopped by and we made him eat one of these. He did it, but his face was not terribly happy. We also sent one to our pal Gary, who actively enjoyed it for some reason. The Goog- I didn't hate this, but it was oddly vegetal, as TD said, but not entirely unpleasant. It certainly tasted healthier than the Parmigiani. 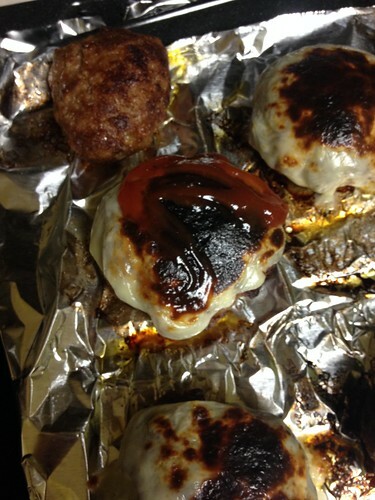 I wouldn't kick it off of my grill, but I'd eat the slightly burnt regular burger first. ROUND 2 DECISION- Frankly, I'm calling this one a tie. While the main dishes were more edible, neither was super exciting, or a recipe that either of us will add to our permanent repertoire. It should be noted that we sent a DC based burger to DC super-fan and notoriously picky eater, Gary S...and he claims to have enjoyed it. And after all, what's a dinner party without dessert, right? RIGHT? I rolled mine in peanuts, because that is what I had available. These weren't too bad, all things considered. My honey was a bit crystallized, which may have contributed to the slightly gritty texture. They were also overwhelmingly sweet. Overall they made me think of some of the diets I see going around right now, like "here's a sweet treat that's packed with protein!" But all things being equal, I think I'll stick to chocolate chip cookies. Do you want to see more recipe battles from these catalogs of culinary creations? Let us know in the comments. Our cooking abilities and stomachs are yours to command!